I’d heard good things about the Silver Surfer series that Mike Allred had been working on, so I decided I should give it a try. Boy was I glad I did! 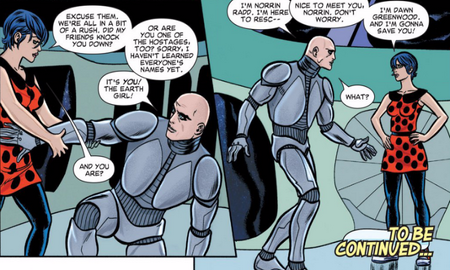 I can’t say I’m much of a fan of the Silver Surfer. From what I’ve seen of him, his personality seems as nondescript as his character design. Also he’s one of those cosmically powered characters who seems to be able to do anything, based on the circumstance he’s been written into. He’s a walking, talking Deus Ex Machina. Where’s the drama in that? A) It quickly establishes a quirky, swashbuckling vibe, and the dangers never seem that visceral or immediate. B) The Surfer is always cosmically powerful, so he can keep Dawn safe in just about any instance. The story begins twelve years before present time, and Dawn is a just little kid wishing on a star. 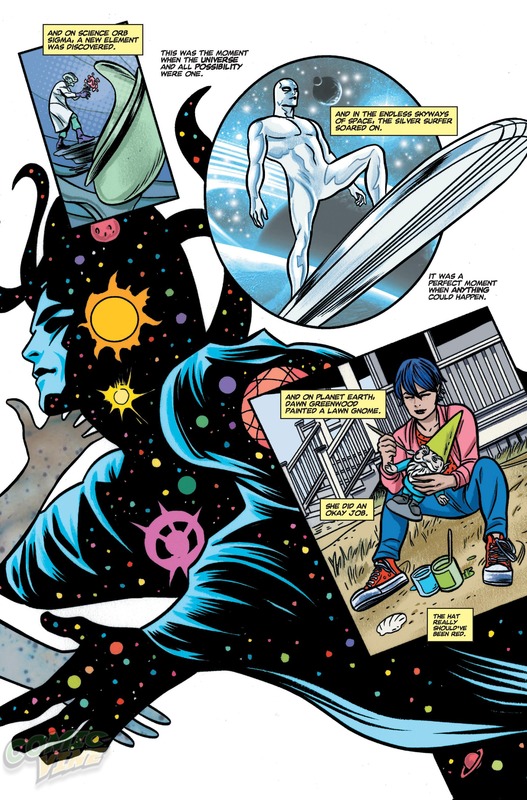 That meteor ends up the being the Silver Surfer, who is in his pre-heroic phase—when we was a enthralled henchman of the planet-devouring god-villain, Galactus. Instead of wishing for something for herself, young Dawn wishes for the falling star—wishes that it will keep flying forever so that it always have the chance to grant wishes to others. 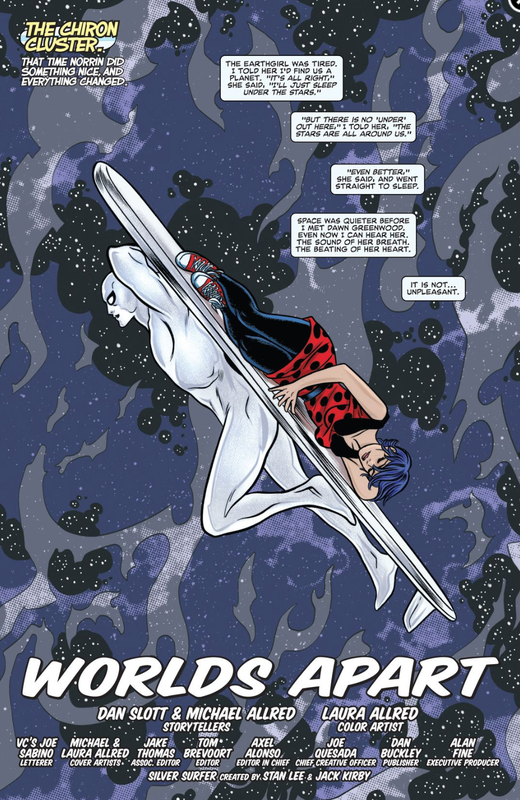 This first connection is never brought up in the series (although maybe it is revealed in the next volume), but nevertheless, the story skips ahead to present-day, and Dawn is abducted as a hostage because some enigmatic cosmic device declares that she is the most important person in the Silver Surfer’s life. How is that possible if they have never really met? 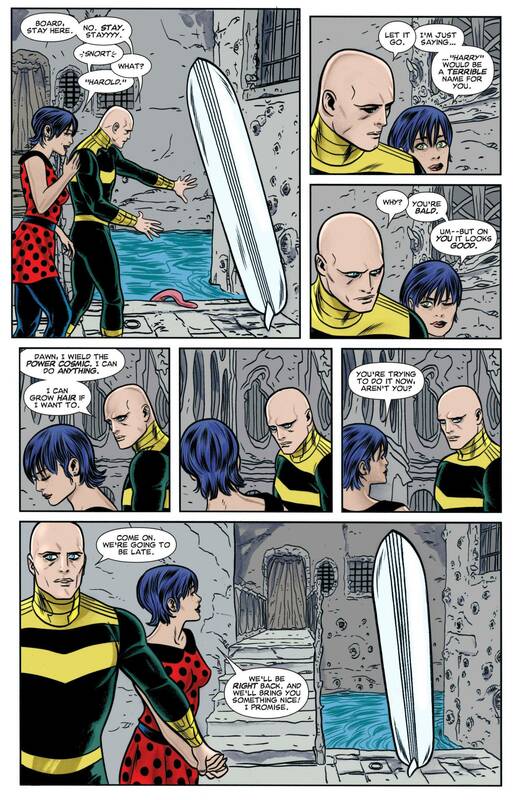 The series spend a chunk of time unspooling the Surfer and Dawn’s relationship. And along the way, they find themselves in some pretty zany predicaments. 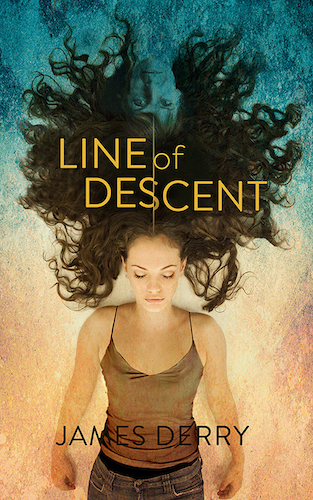 They tangle with the Never Queen, who is the cosmic entity who embodies of all unrealized possibility. They go to a planet where everyone is obsessed with being the ONE perfect expert in their profession. On this adventure, they meet Warrior One, Banker One, Ice-Cream Maker One, etc. They return to visit Dawn’s family just in time to face off against the obviously-name villain Nightmare. Then we’re treated to a classic ‘everybody faces their greatest fear’ adventure. Add to that a ‘time-loop’ adventure that’s laid out so that the comic book issue can be cut up and pasted together into an real Moebius strip. Seriously. Along the way there’s plenty of nice, smaller moments. Like the one where the Surfer has to get used to traveling across interstellar distances with a human who has to eat and drink three times a day, and pee and poop out all that stuff even more often. But the highlight of this run is a multi-part story where the duo find a hidden planet occupied by 666 billion refugees from 666 billion worlds. Hmm, what kind of monster could have destroyed that many planets? (Burp!) and who is the former indentured servant who helped lead that monster to all these worlds? Let’s just say that the Surfer’s past comes back to haunt him, and it leads to a turning point in his Dawn and his relationship. And also a clash of cosmic powers that is actually truly memorable. The story culminates with a ‘I am Spartacus’ moment that ‘calls back’ to the Surfer’s origin story, and that is actually pretty emotional. It’s one of the best pure superhero stories I’ve read in a long time. I’d highly recommend the series, if you’re looking for comic-book in the vein of Guardians of the Galaxy or Doctor Who. And the good news is that there’s a volume of Silver Surfer with the same creative team, so that means a whole other galaxy of possibilities and adventures to explore!